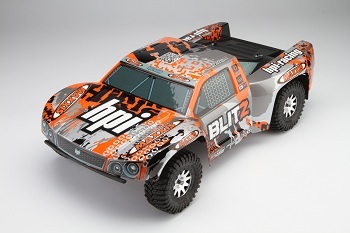 The HPI Blitz, the Short Course truck that took the scene by storm by combining the best in durability, performance, looks, style and innovation all into one ready-to-run package, is back and better than ever! The Blitz has received a makeover packed full of exciting new additions to once again set the precedent as the best Short Course truck on the market! The new Blitz RTR is now equipped with a high quality 2.4GHz radio system for crystal free driving, along with an all-new waterproof SC-15WP ESC and receiver box for wet weather excitement. Also included is a full set of bonus accessories necessary to get you up and running as soon as you open the box! A Plazma stick pack,t AA’s, and charger make running quicker and easier than ever. Topping everything off is a fresh new Skorpion body and graphics that has as much function as it does form. The new and improved Blitz now features a high quality HPI 2.4GHz radio system. This provides you with the confidence and comfort of crystal free driving, making frequency conflicts a thing of the past. A built-in failsafe is also standard, bringing the truck to a safe and controlled stop if it somehow loses radio signal or battery power. To get your brand new HPI Blitz shredding up the local track, driveway or backyard as soon as possible; all of the necessary running items are included in the box! A rechargeable 7.2V Plazma battery pack, AC wall charger, and even a set of Plazma AA batteries for your transmitter are all there. Just charge the battery and you’re ready to go! The Blitz is topped off with an all-new Skorpion body that was designed to not only look great with a wide and aggressive stance, but to also perform as well as it looks. The Skorpion body has received treatments in various areas to aid in the overall handling and feeling of the truck, both while driving it, and also while airborne. The body comes in two slick new color offerings, pre-cut and ready to go. The Blitz carries on the legendary durability that the HPI lineup is known for, and takes many of its nearly indestructible cues from the E-Firestorm line. Features that are options for many other trucks out there, these are standard equipment here. Such as the tough, all metal gear bulletproof transmission, aluminum hex hubs, Baja inspired skid-plates, high performance threaded shocks, high-impact nylon absorbing short course bumpers, just to name a few. Now equipped with a waterproof SC-15WP ESC and SF-10W waterproof steering servo, along with a waterproof receiver box to tackle wet conditions such as rain, snow, and mud. A high quality TF-40 and RF-40 2.4GHz radio system is standard equipment for crystal-free driving. Everything to get you running is included right in the box. A 7.2V Plazma battery pack, AC charger, and Plazma AA batteries. The HPI Blitz uses nothing but the finest grade, high-impact nylon plastic on the most critical areas of the truck – from the bumpers to the super beefy arms and everything in between. HPI’s industry known strength and durability makes the Blitz friendly for all – be it an R/C newcomer, or the skilled competitor. The Blitz features a main chassis based on the E-Firestorm – lengthened to deliver the most stable feel a short-course truck can offer. The blistering Firebolt 15T motor provides plenty of power – from speed runs to competing at your local track. all R.C. cars should be waterproof . I really wish it had a brushless 13.5T option… but when does it hit shelves? Every time i get an new car an even newer version comes out. Happened with my baja, blitz, mini crawler, stampede, rc18, savage. They should have that thing where they buy it back if there is a new version kinda like best buy. These upgrades just put the Blitz solidly at the top of my “must have” list, particularly the change to 2.4GHz. I also like the looks of the body and graphics. Well done, HPI!